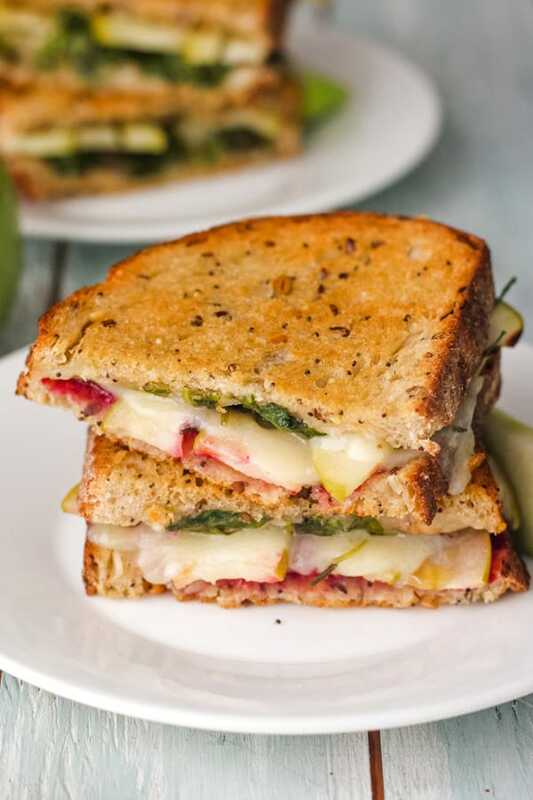 Grilled Cheese with Apple and Havarti are the perfect quick dinner for two. These easy toaster oven sandwiches come together in less than 15 minutes! Are you feeling overwhelmed by this year’s Holiday Season To-Do List too? 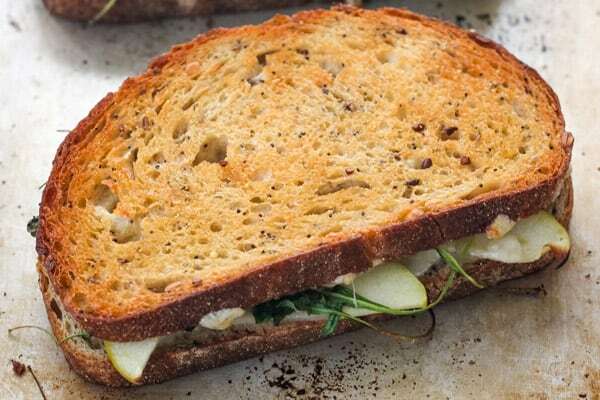 For hectic times like these, sandwiches are my go-to meal. They’re the trifecta of low-stress dinners: FAST. EASY. FILLING. 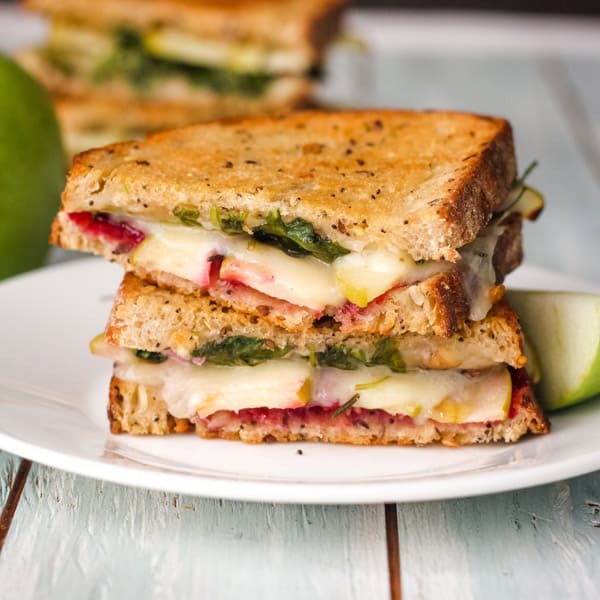 Right now, we’ve got this ooey-gooey grilled cheese with apple and Havarti on repeat. It’s satisfying without being heavy and has a great Fall Harvest Vibe going on. Crusty whole grain bread slices. 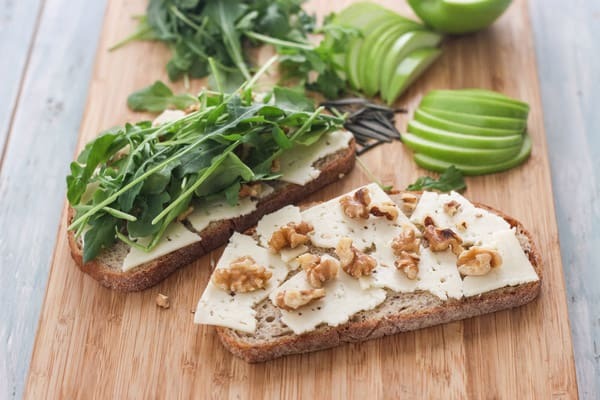 Good cheese – I like a creamy Havarti but smoked Gouda or even sharp cheddar would taste fantastic. Half a crisp Granny Smith apple, the thin slices soften slightly during cooking. Buttery walnuts for an unexpected crunch. Greens! Peppery arugula is my favorite but baby spinach is a great option too. Oh and fresh rosemary if you’ve got it on hand from making these snackable rosemary cashews. My husband likes a big smear of stone ground mustard on his sandwich. If you like things sweeter, apricot preserves or honey are excellent choices too. During the holidays, I always reach for the leftover cranberry sauce or these balsamic roasted cranberries. 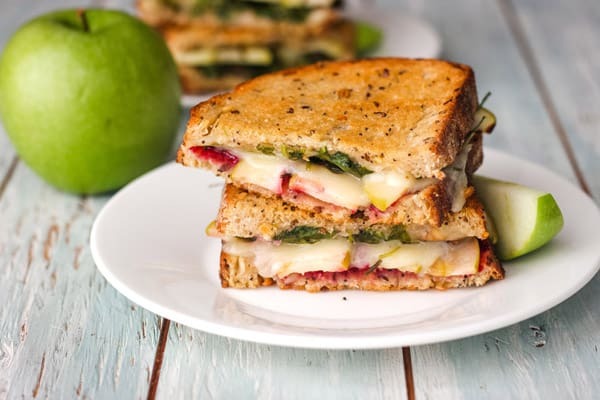 The combination of apples + cheese + cranberries is irresistible! 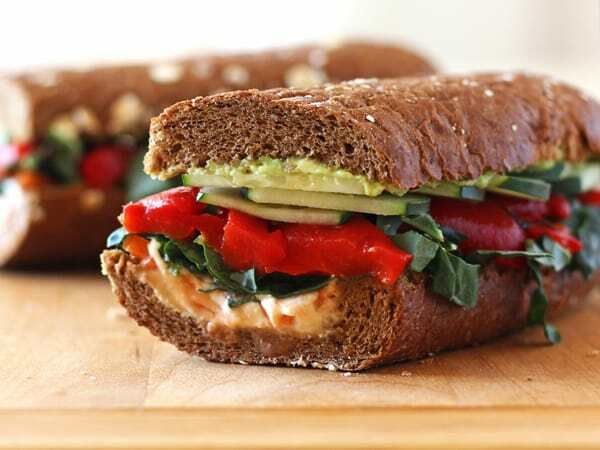 During the summer, these Red Pepper, Carrot, and Hummus Sandwiches or Spicy Chickpea Edamame Salad Pitas are my go-to favorites. In the Spring, when leftover hard-boiled eggs are easy to come by treat yourself to a Sriracha Egg Salad Sandwich (With Garlic Kale Chips). They’re spicy, creamy and good for you too! But in the cooler fall and winter months, nothing beats a warm and comforting toaster oven grilled cheese sandwich. If you haven’t been using your toaster oven to make grilled cheese, you’re missing out. The bread gets golden and toasted while the filling is perfectly warmed through. Plus, once you get the timing down for your little oven you barely have to pay attention while it cooks. Preheat your pan. You should hear a sizzle (just like the griddle) when you add the sandwich to the pan. Use a good melty cheese like Havarti or provolone. Avoid shredded cheese, it tends to melt into the bread and disappear. Don’t skip the flip. Flipping the sandwich halfway through the cook time will ensure even browning and melting. Layer on the flavor. Feel free to get creative and add your favorite condiments, vegetables, nuts, and fruit. mmm, i love apple on my grilled cheese! i haven’t used havarti before but i’d certainly be willing!